Beautiful bites of chocolate from Elaine Hsieh Chocolatier of Somerville, Massachusetts. Photo courtesy Elaine Hsieh. 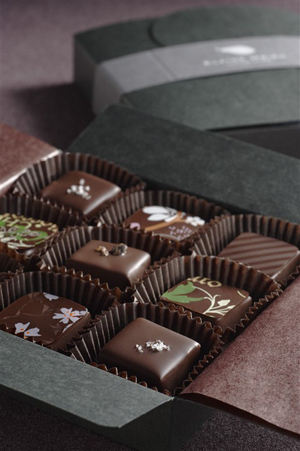 WHAT IT IS: Caramels and flavored ganaches in classic flavors. WHY IT’S DIFFERENT: Exquisitely hand-painted. WHY WE LOVE IT: Happy and colorful. Glaze. Jump in to asparagus season! sweet, crunchy treat for everyone. Behind every there’s a good partner. Elaine Hsieh Chocolatier is a partnership between Ms. Hsieh and Catharine Sweeney. 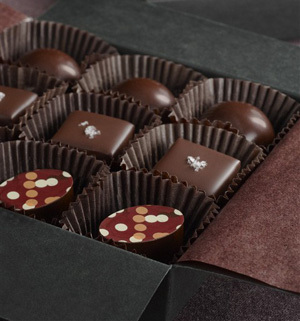 The delicately-flavored bonbons are beautifully crafted. The flavors are seasonal. Our assortment included Dark & Stormy, a riff on the cocktail of the same name that is a mixture of rum and ginger beer. The white chocolate ganache is flavored with dark rum, ginger and vanilla. The Earl Grey is an infusion of bergamot oil, the distinctive flavoring in Earl Grey Tea, into dark chocolate ganache. The Jasmine Tea piece, perfumed with jasmine blossoms, is the best jasmine ganache we’ve ever had. Coconut, with chewy pieces of coconut, is a connoisseur version of Mounds. Other pieces in our box included an enrobed Burnt Caramel, and Pear, in the form of pâte de fruit enrobed in dark chocolate. Rochers (row-SHAY), French for rock, refers to a pile of chocolate-coated sliced almonds that look more like a haystack. The crunchy roasted and candied almonds are mixed with caramel and coated in dark and milk chocolate. Ancho Bars: Those who like heat in their chocolate should definitely order a bag of these! A combination of spiced nuts, pretzels and Balvenie Scotch-flavored caramel, covered in 65% single varietal chocolate, it’s a must-try balance of sweet heat and crunch. The Caramel Collection: Bourbon Caramel (with Knob Creek Bourbon), Salted Caramel and Honey Caramel. You don’t have to celebrate Passover. This is a sweet, crunchy treat for everyone. Jump in to asparagus season!